Maruti Suzuki recently launched the Ignis hatchback in India with a starting price of INR 4.59 lakh. 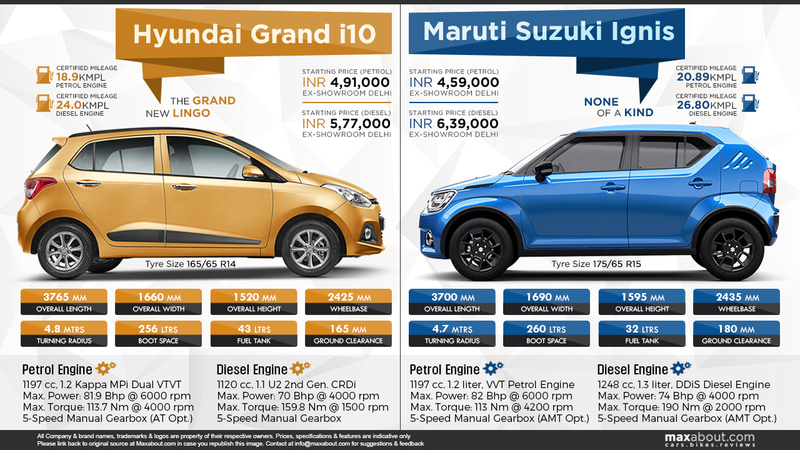 The car closely rivals Hyundai i10 Grand and this infographic compares the physical values between both the Indian cars. Grand i10 is 65 mm long, 30 mm narrow and 75 mm lower than the Maruti Ignis. Even when the Maruti hatchback is short in length, it gets 10 mm more wheelbase than the Hyundai Grand i10. Ignis even starts INR 28,000 lower than the Grand i10 while providing a better mileage in both petrol and diesel spec models. Hyundai Grand i10 comes with a conventional design while Maruti Ignis can be spotted easily among all other cars around the segment. Maruti wins when it comes to power and gearbox options as the Ignis loads AMT in both petrol and diesel models. The diesel Ignis is even producing much bigger torque value than the Grand i10. If a buyer wishes to go for diesel base model, Hyundai Grand i10 offers the same for INR 5.77 lakh while Maruti Ignis skips the Sigma model and directly starts from Delta at INR 6.39 lakh. Ignis looks bigger with large alloy wheels and impressive tall boy design.